The Sinclair Priming Tool is one of the finest tools we manufacture. Handloaders around the world have told us “this is the best priming tool in the world”. The Sinclair Priming Tool is manufactured from the finest materials available. 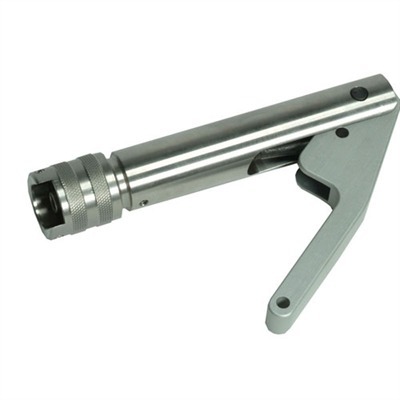 The main body, head, and punch housings are all made of stainless steel, the handle is machined from aircraft grade aluminum, and the pins and pushrod are hardened. These materials insure the owner a lifetime of trouble-free use. The Sinclair Priming Tool comes complete with housings and punches for both large and small primers. The tool head utilizes Sinclair Priming Tool Shellholders and locks the case head square to the priming punch. The leverage of the tool is outstanding, yet extremely sensitive so you can feel the primer entering the primer pocket and bottoming out. Our tool is made for single feeding of primers. Our tool is expensive but made with consideration for quality and to provide the user with a well-made tool that will last a lifetime and more. There are no plastic parts to wear or break.